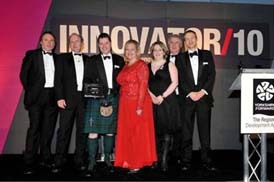 From left to right: Yorkshire Innovation – Richard Gregory, Eden Project Founder – Tim Smit, Radio Design Managing Director – Eric Hawthorn, Yorkshire Forward Board Member – Julie Kenny, Radio Design Filters Expert – Liz Phillips, Radio Design Programmes Director – Paul Trigg and Radio Design Systems Expert – Martin Gostling. Radio Design was presented the Young Innovative Business Award at the Yorkshire Forward Innovator/10 Awards Ceremony, which took place on the 3rd March 2010. We are delighted to have won this award which is aimed at businesses that have shown creativity and entrepreneurial flair in the launch and early growth of a business.